I’ve had some time in the shop to get things cleaned up and make the place easier to work in. This is one of the improvements. I made a drill press table out of some scraps laying around the shop and some hardware from various places. It has some jigs to go with it, as seen in the pictures. 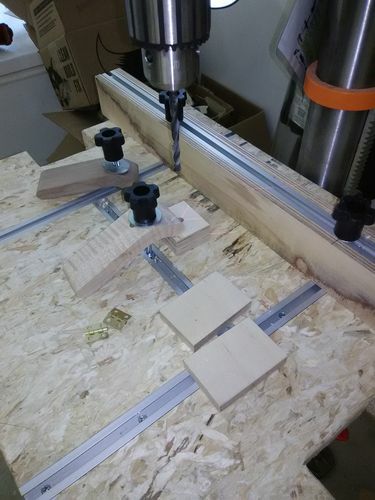 I have a vertical clamping jig, two hold-downs, and two flip-stops on the fence. The fence is fully adjustable (or removable) as are all the other jigs. They all ride in 3/4” T-track. Why the notches cut out of the sides? Because my scrap had notches, that’s why! for the last three day, 102 yesterday, 101 the day before, and 100 the day before that, I think i will wait a little while. There is a point when the fun stops. I like it! A really good job of using what you have to build something super useful. I need to build one for my drill press too. Thanks for posting it. 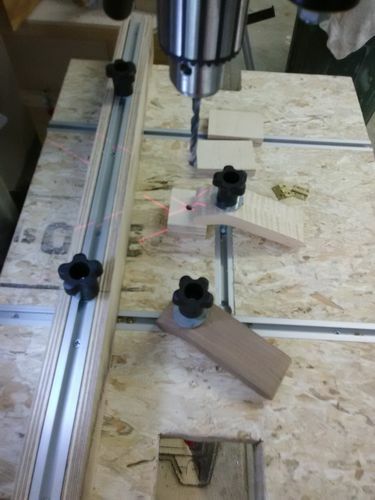 I built drill press table but not as functional as yours, my largest object to over come was extending the shafts to raise and lower the table as well as the shaft to lock the table. Nice work. I go back and forth about the need for a DP table in my shop efforts. Each time I see a new one I think I should go make one, and then something else comes up. I will keep this one so I can find it for inspiration. This is a real nice drill press. THanks for the comments / compliments, all! dbeck, the toggle clamps work quite well. Super fast to unclip and take the table off for drilling steel. They seem to hold it really solid. I only had two at first, and I could wiggle it a tiny bit, so i added the third on the front, and that took care of it.